Welcome to my website....lennylaks.com. Ring Around The Sun, my first solo CD, has been out for 6 months and I am jazzed.... getting some local airplay...and some great feedback from my email people. 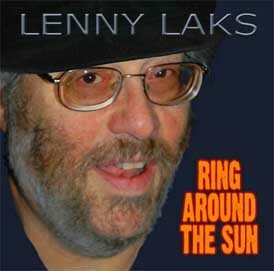 You can get on the mailing list just by sending mail to lenny@lennylaks.com . Also I had a terrific birthday party, in May and “The Lenny Show”, as JC calls it, was really bumpin’... Thanks to all .... It really was an amazing event. Very humbling. to help spread the anti-war message......You can listen to it and download it on my MP3 page. I hope you hear it. ..please work to stop the insanity of war. I am sure more songs of this type are coming....stay tuned. Please visit the links page. I have some very talented friends, and you can get access their work. Also, there’s an order page secure credit card link (paypal) that you can use to purchase my CD....Ring Around The Sun. You don't need a Paypal account....they just make it more secure. Well please trip around the site a little, and send some email...lemme know your thoughts.....some feedback, or just get on my mailing list for updates and news.